Luciano is a little boy who loves his yellow puddle-stomping boots. Even when he is too sick to wear them outside to play, they are still his favorite, because Sunshine Boots are good for your soul. Luciano and His Sunshine Boots is a heartwarming story that expresses the hope and happiness of childhood in the face of a chronic illness. 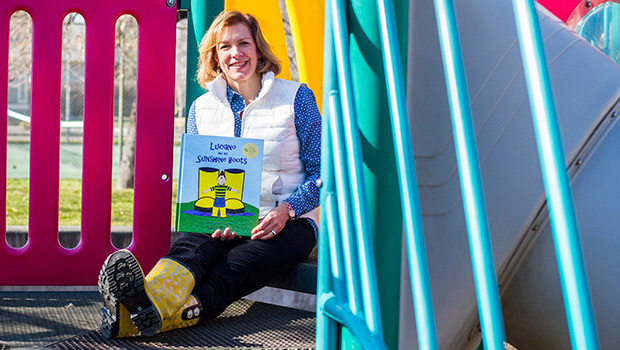 Carol Myers wrote and illustrated her book, “Luciano and His Sunshine Boots” to tell the story of her son, who at a young age was diagnosed with ulcerative colitis, a chronic bowel disease that causes inflammation in the digestive tract. This leads to symptoms such as abdominal pain, diarrhea, and rectal bleeding. Initially, Luciano was on medications to help treat the symptoms of the disease. After a few months, he stopped taking prednisone, because his blood work returned to normal on the diet. At about age 12 he made the decision to no longer use any anti-inflammatory prescriptions. Aside from a few flares, his childhood was healthy and active, playing sports and enjoying the things he loves. Along with her son’s health, the SCD lifestyle has impacted Myers in many ways. The most lasting impression has been in how Myers and her family select which foods to eat and where those foods should come from. They grow their own foods or find the best local organic foods available to eat. Their home is surrounded by edible landscaping with a large variety of fruits and vegetables right outside their door. Myers also has a small bee colony for pollination and the health benefits of raw local honey. “On any given day you might find us happily gardening in our Sunshine Boots,” said Myers. Another way the SCD lifestyle has influenced Myers is her desire to share her family’s story and success. By writing her book, she has been able to reach out and let other families with chronically ill children know they are not alone in their struggle to find health. “Luciano and His Sunshine Boots” depicts a future of promise, where sunshine boots brighten any situation. You can learn more about the book and its author, Carol Myers at www.sunshineboots.com. You can purchase a copy of “Luciano and His Sunshine Boots” from local area Hastings Book Stores, Penny Lane Kids, Family Christian Book store and the North End Organic Nursery. It is also available on the website and Amazon. This feature was originally published in Greenbelt Magazine as well as their online publication on March 9, 2015. Previous Why the Emphasis on Athletics in Schools?